Summon Zombie Dogs is a Defensive Witch Doctor skill unlocked at level 4. It summons several zombie dogs, commonly known as "mongrels" which tank for the Witch Doctor. The dogs fight and damage enemies, but their damage is quite low, making their main function that of tanks or distractions. The best way to deal damage with them is via the Sacrifice skill, which detonates all of the dogs, dealing potentially enormous damage, when stacked with other skills and passives. At the time of Diablo III's launch, the hit points and defense of Mongrels and other Witch Doctor pets did not scale up adequately, making them useless by Hell difficulty, since any monster would kill them in a second. Fans requested much improved minions, a much reduced cooldown, or both, and Blizzard admitted that the pets were not functioning as planned at higher levels and said they would look into adjusting their value in a future balance patch. Zombie Dogs have good foot speed and are fearless, if not very damaging with their hand to hand combat. Sacrifice deals far more damage than the mongrels ever will. They are also useful as tanks or distractions, detaining monsters in combat and allowing the Witch Doctor to get in free shots at stationary enemy targets. Refer to the Summon Zombie Dogs rune effects page for thorough descriptions of all five rune effects in this skill, including screenshots, videos, and strategy tips. All versions of the Dog, including un-runed. Summon Zombie Dogs is the first summoning skill most Witch Doctors will ever use, and forms the backbone of early Witch Doctor strategy. The dogs are not very strong individually, either in giving or taking damage, but they are effective meat shields, allowing the Witch Doctor to use his attack spells from the back row. Players assumed the dogs would be viable tanks or even weapons throughout the game, but shortly after Diablo III's launch it was discovered that Mongrels and Gargantuans were underpowered and had far too few hit points to survive more than a few seconds on higher difficulty levels. As a result all early Witch Doctors in Hell and Inferno were forced to play petless builds. Blizzard vowed to adjust this unfortunate reality in a patch. Shortly before release, a strategy article on Diablo.IncGamers.com did some theorycrafting and revealed that Zombie Dogs + Sacrifice, when stacked with the right passives and other skills, could deal amongst the highest damage output in the entire game. The math was sound, and damage from 10,000-25,000% weapon damage is possible, but at least partially due to the underpowered survivability of Mongrels on higher difficulty levels, this strategy was not much pursued in those early days. 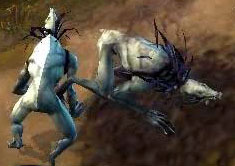 Summon Zombie Dogs debuted with Diablo III in the WWI 2008 gameplay video, where the skill was in the Voodoo Skill Tree at Tier I. Summon Zombie Dog was called Summon Mongrel (as Mongrel was the original name of the Zombie dog), and mongrels could be enchanted with Locust Swarm or Skull of Flame, among other spells. For BlizzCon 2009, the skill was moved to the Zombie Skill Tree. By then, skill enchantments had been removed, replaced by skill rune enhancements. For a brief period of time, this skill apparently cost health instead of mana. I saw them finish off the last zombie on screen a number of times, and I don’t recall ever having to summon new ones simply because the old ones had gotten stuck or lost around some corner of the dungeon. That speaks to their pathfinding as well, since the dungeons in this year’s Blizzcon PvM demo were made largely from narrow corridors and were quite windy and full of sharp corners and obstacles. Witch Doctor walking two pets. Better known as “Mongrels,” this is the default tank for the beta, and a very effective one. The dogs don’t have a lot of killing power — all three of them on the same normal enemy is considerably slower than any Witch Doctor attack spell — but they’re not meant for damage in their base form. They’re meat shields, and they do a pretty good job of that. This skill previously worked with “one cast per dog,” so it took three casts to get all three of them out. (And you got more dogs with more skill points.) No more; now a single cast summons all three dogs, or re-summons fresh ones if your current batch are wearing out or one or more have died. It’s a full replacement cast, too; if you have two left you don’t just cast one new one to join the others; you get three new dogs. The skill system was once again overhauled for the Beta Patch 13 in February 2012, and Summon Zombie Dogs was classified as a Defensive skill and moved to level 4. See the Witch Doctor skill archive for more details on previous versions of Summon Zombie Dogs (or Summon Mongrel) and other Witch Doctor skills. Summon Zombie Dogs is the spiritual successor to Diablo II's Necromancer skill Raise Skeleton, which is also a low-level tanking minion summoning skill. Witch Doctor with two Dogs. This page was last edited on 6 June 2012, at 23:06.